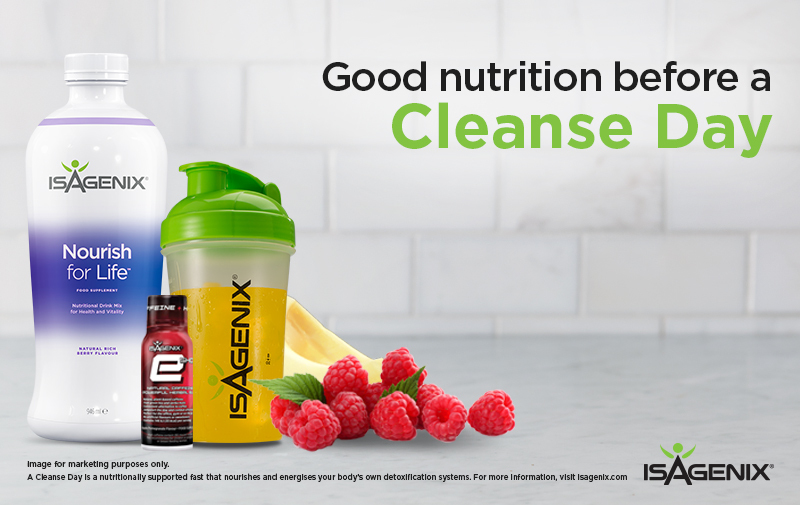 Many people choose not to or can’t have dairy-based products, but still want to benefit from Isagenix Cleanse Days* and other dairy-free products. Whilst this has always been possible, now that we’ve launched My Pack in Europe this has just got a whole lot easier! Cleanse Days* aren’t complicated, but for most people they are very different from the usual daily routine. The overall goal is to significantly limit calories for a period of up to two consecutive days per week (a total of four days per month) while receiving nutrients from Nourish for LifeTM and other Cleanse Day* snack options. Cleanse Days* are about letting your body rest and recharge – there are no laxatives or diuretics involved. On a Cleanse Day*, we recommend four servings of Nourish for Life, spaced evenly throughout the day in the morning, noon, late afternoon and evening. Although a Cleanse Day* involves giving the body (especially the liver) a break from normal levels of digestion, you can choose from Cleanse Day* support tools, or small snacks, to help you manage cravings and provide steady energy while keeping calories very low. Whilst products for a successful Cleanse Day* are important, good nutrition in the days leading up to a Cleanse Day* is equally, if not more, important. You need to provide your body with the nutrients it requires for a successful Cleanse Day*. IsaLeanTM Shakes are a balanced meal replacement that are easy to fit into your day and require little planning, so a perfect solution for those that can consume dairy. However, if you’re not able to complete a Shake Day just yet this doesn’t mean you can’t have a successful Cleanse Day*, it’ll just require a little more planning for now. Our tips below will help to make sure you’re giving your body what it needs in the lead up to a Cleanse Day*. These types of foods should also feature in your daily diet for good nutrition. You should be consuming three healthy, balanced meals each day. These meals should provide protein, fibre, vitamins and minerals. IsaLean Shakes provide 240 calories, so if you’re goal is to lose weight we’d recommend aiming for this calorie target for two of your meals each day. Your third meal should provide between 400-600 calories, and should follow the guidance in the System Guides. Aim for 240 calories – using a calorie checker such as this one from NHS Choices can help you to estimate the calorie content of your meals. Include 20-40 g of protein. Your sources will differ depending on whether you’re vegetarian, vegan, or lactose intolerant, but can include eggs, pulses, meat, poultry, fish, shellfish, tofu, nuts (including nut butters) and seeds. Base your meal on starchy carbohydrates to get plenty of fibre – this can help you to feel full. Some examples include brown rice, quinoa, wholewheat noodles, potatoes, polenta and pearl barley. Include plenty of fruit and vegetables. These will provide vitamins, minerals and fibre. As fruit and vegetables tend to have a low energy density, filling your plate with plenty of these foods means you can reduce your calorie intake without having to reduce the amount of food on your plate. Choose unsweetened calcium-fortified versions of dairy alternatives. You should never go into a Cleanse Day* if you’re feeling unwell, run-down, or having digestive problems like constipation. Be sure to feed your body with good nutrition for as many days as you think appropriate before undertaking a Cleanse Day*. Cleanse Days* are flexible, and providing you keep the general guidelines from the System Guide for Weight Loss in mind, you can tailor them to suit your personal preferences.